A young campaigner has called on other disabled people to share their experiences of successful employment in order to help narrow the disability employment gap. Lauren Pitt told a fringe meeting at Labour’s annual conference in Liverpool that she wanted to see disabled people use social media to share their good experiences in the workplace. Pitt (pictured, right) has contributed an essay to An Inclusive Future, a new publication by the Fabian Society, Scope and the union Community. In her essay, she writes about her experiences of graduating with a 2:1 degree, and then applying unsuccessfully for more than 250 jobs in which she disclosed in nearly every application the fact that she was blind. She says in her essay: “Many of the people told me I was inspirational, but that was not what I wanted to hear. She eventually secured a job with a social enterprise that had never previously employed a disabled person. But she told the fringe meeting that it had taken four weeks for the government’s Access to Work (AtW) scheme to provide the assistive technology equipment she needed to do her job, and that AtW had originally warned her that it would take eight weeks. Pitt told the meeting: “We need to have disabled people using their experiences and showing what they are doing. She said her “dream” was to see more disabled people in work, and added: “I want what people currently see as extraordinary to be seen as ordinary. “Use the people who are in work and who are having a good experience. We need to be using those experiences that are positive to educate employers and potential employers. 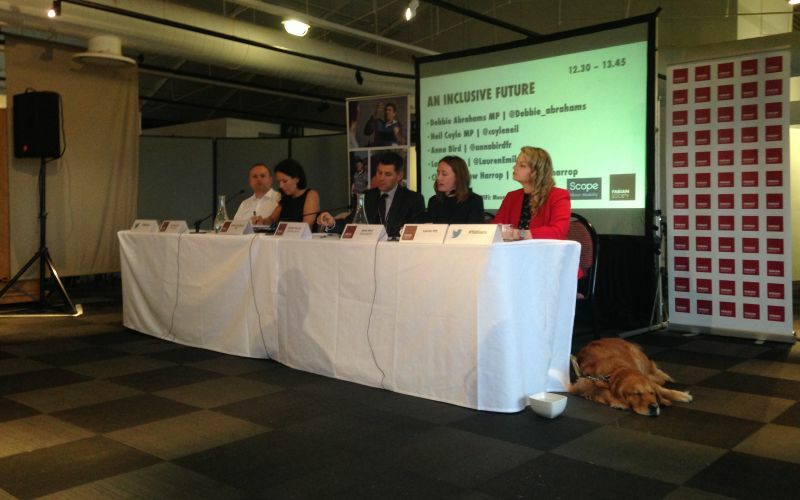 Debbie Abrahams (pictured, second from left), the shadow work and pensions secretary, told the event that the government was “failing miserably” in its efforts to halve the disability employment gap. She said there was a need to change the culture of the out-of-work disability benefits system, including the work capability assessment – which Labour introduced, but she said it would now scrap if it won the next general election – and the use of sanctions, “so it is about support, so it is not a punitive system that so often makes people feel so worthless”. She agreed with Pitt that there was a need for role models who will “trail blaze” and show “what can be done”. Wayne Blackburn, a disabled councillor with Pendle Borough Council, said he believed the party should “lead by example and have more disabled MPs, more disabled representatives across the whole spectrum”. Labour MP Neil Coyle (pictured, left), a member of the Commons work and pensions committee, said the current and previous governments had presided over “dramatic reductions in support” for disabled people seeking employment over the last six years. He said there had been a fall in the proportion of working-age disabled people in work, while the number of people receiving Access to Work was still below the number in Labour’s last year in government, there had been cuts to the budget of the Equality and Human Rights Commission, and to legal aid, and to the number of specialist disability employment advisers in jobcentres. 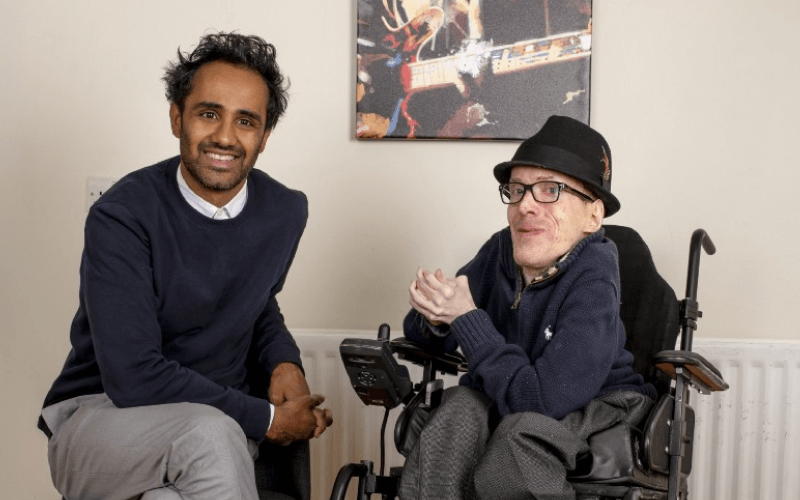 Coyle, a former director of Disability Rights UK, who also worked at a senior level for the Disability Rights Commission, said there “absolutely must” be an awareness-raising campaign to show what disabled people can do in work. In his own essay in the publication, Coyle says the shift from manual, industrial labour to service and financial sector jobs “increases opportunities for many more disabled people to play a more active part in mainstream workplaces”, while the growth in home working and advances in IT and accessibility software have also increased opportunities for disabled people. He told the fringe event that the government had wasted money through its short-term approach – including a failure to invest more in Access to Work – and he heavily criticised the move away from having a disabled people’s minister with a cross-government role.